This is your new beginning for a healthier lifestyle and making environmentally - friendly living spaces for both you and your surroundings. For safe and effective use of the Electronic Cigar please read the instructions within this user manual before you begin using this product and its supporting accessories. by a micro-electronic technology. It allows smokers to enjoy the tangible and emotional feeling of smoking without the fire, flame, tobacco, tar, carbon monoxide, ash, stub or smell found in real Cigars. It is reusable by recharging the battery, so there are no buds or ashes to dispose. The smoker will get the nicotine that they crave, and the “smoke-like” vapor admitted will create an illusion similar to the smoke from a real Cigar. The Smoke Free E-Cigar does not create smoke or tobacco odor, but instead a vapor. It offers smokers the freedom to use this product in Public locations (indoor or outdoor) where smoking is not allowed. It gives you the opportunity to enjoy a smoke free experience without changing your lifestyle and harming your surrounding environment. Now is the time to join the future of alternative smoking! Free of tar and other carcinogenic substances harmful to the human body. Can be used in public places (indoor or outdoor). Shielded electromagnetic (free of electromagnetic radiation). 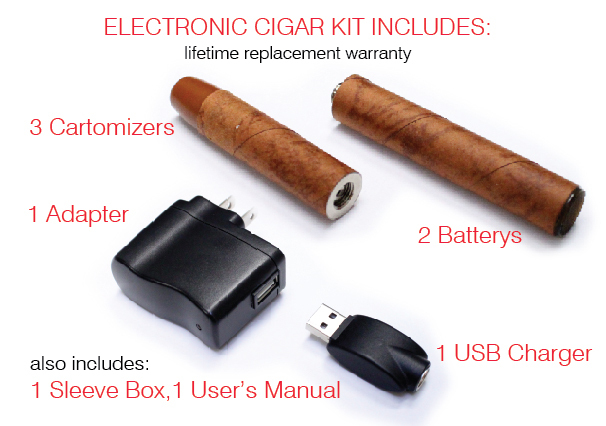 The E-Cigar is an integrated structure consisting of 2 parts; the battery and the cartomizer. Each part has a spiral edge enabling the two pieces to bind to each other. The cartomizer will connect to the battery by simply twisting the spiral edge of the battery. You must disconnect the product the same way you put it together. Remember, before you start to use your electronic Cigar device, you must charge the battery. The input supply voltage of the charger is AC100V-240V 50/60Hz. 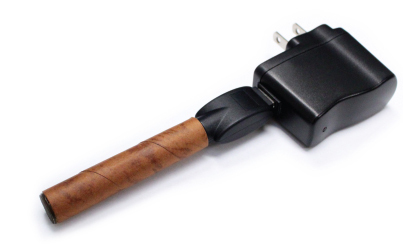 This charger was specifically designed and dedicated to use with the Smoke Free Electronic Cigar battery. 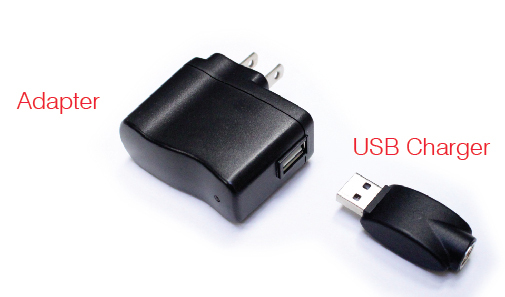 In order to properly use the charger, please connect the USB charger to the Adapter and the plug into an electrical outlet or socket. You are now ready to place your battery into the charger. from the charger by untwisting it. Since the battery is partially charged the indicator light on the Adapter might stay green when charging for the first time. accordingly. Once you have removed the battery from the charger jack, you may attach the Cartomizer to the battery. Remember you do this by simply twisting or screwing the spiral edge of the Cartomizer to the spiral edge of the battery. Once the battery is intact with the Cartomizer, you may begin smoking your E-Cigar. Bring the Cartomizer to the mouth and place between your lips. To activate the device begin by inhaling on the Cartomizer as you would from a regular Cigar. The red indicator will light up when used, and will stop when you stop inhaling. The best angle of using this device is horizontally and it is not appropriate to use it upwards to prevent any small amount of liquid from flowing into the mouth. The electronic Cigar is not intended for use by minors under the age of 18, non-smokers, persons whom have allergies to nicotine or any components of inhalants, or pregnant and breast-feeding woman. Please remember to consider the laws and regulations of your region when using your electronic Cigar device. Take precautions when driving, and ensure your strict compliance with the relevant laws. This is a high-tech electronic product so please take caution to avoid any collisions to the electronic Cigar when carrying it with you as it can cause damage to the electronic Cigar. (Best to be carried in the carrying case). The nicotine dilution contained in the cartridge of this “Electronic Cigar” is prohibited from direct contact with mucus. No direct entrance to the mouth is allowed. If the battery is found to be emitting any odor, heat, discoloring, deformed, or has any abnormalities during charging, please cut off the power source immediately and remove the battery from the Cigar body or charger and suspend the use of it. Puff on your e-cig like you would a regular cigarette. 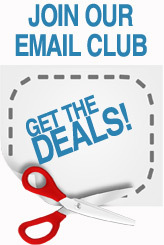 Visit us at www.smokefreeonline.com to see our entire product line and check out our specials. Be sure to follow us on facebook and twitter. If your battery or recharger fails to properly hold a charge or otherwise malfunctions, call our customer service department at 800.653.8594 and tell them the problem. The customer service representative will issue you a Return Merchandise Authorization (RMA) number with instructions on how and where to return the product. Once returned, we will send you a replacement. When returning the product please use a padded envelope. Enclose a note with your name, address, phone, e-mail address, RMA number and the reason you are returning it. Put the RMA number on the outside of the envelope. Mail to: Smoke Free, Inc. Customer Service, 11403 Cronhill Drive Suites B-C Owings Mills, MD 21117. IN NO EVENT SHALL SMOKE FREE, INC. BE LIABLE FOR ANY DIRECT, INDIRECT, SPECIAL, PUNITIVE, INCIDENTAL, EXEMPLARY OR CONSEQUENTIAL DAMAGES, OR ANY DAMAGES WHATSOEVER, EVEN IF SMOKE FREE, INC. HAS BEEN PREVIOUSLY ADVISED OF THE POSSIBILITY OF SUCH DAMAGES, WHETHER IN AN ACTION UNDER CONTRACT, NEGLIGENCE, OR ANY OTHER THEORY, ARISING OUT OF OR IN CONNECTION WITH THE USE OR PERFORMANCE OF ITS PRODUCTS. THESE LIMITATIONS SHALL APPLY NOTWITHSTANDING ANY FAILURE OF ESSENTIAL PURPOSE OF ANY LIMITED REMEDY. BECAUSE SOME JURISDICTIONS DO NOT ALLOW LIMITATIONS ON HOW LONG AN IMPLIED WARRANTY LASTS, OR THE EXCLUSION OR LIMITATION OF LIABILITY FOR CONSEQUENTIAL OR INCIDENTAL DAMAGES, THE ABOVE LIMITATIONS MAY NOT APPLY TO YOU. Smoke Free products (“products”) are intended for use by persons of legal smoking age only. Products are considered a smoking alternative and not to be considered or construed as a smoking cessation product. Products are not intended to diagnose, treat, cure, or prevent any addiction, disorder, disease or physical or mental conditions and should not be used as a substitute for your own physician’s advice. Keep products out of reach of children and pets; ingestion of certain pieces can present a choking hazard, and ingestion of non-vaporized concentrated ingredients can be poisonous. THIS PRODUCT CONTAINS NICOTINE. Nicotine is addictive. Women who are pregnant or breastfeeding, or persons with or at risk of heart disease, high blood pressure, diabetes, or taking medicine for depression or asthma should not use product. Consult a physician if you experience nicotine misuse symptoms such as nausea, vomiting, dizziness, diarrhea, weakness and rapid heartbeat. If you smoke tobacco products, you are encouraged to stop. Warning for California Residents: This product contains nicotine, a chemical known to the State of California to cause birth defects or other reproductive harm.